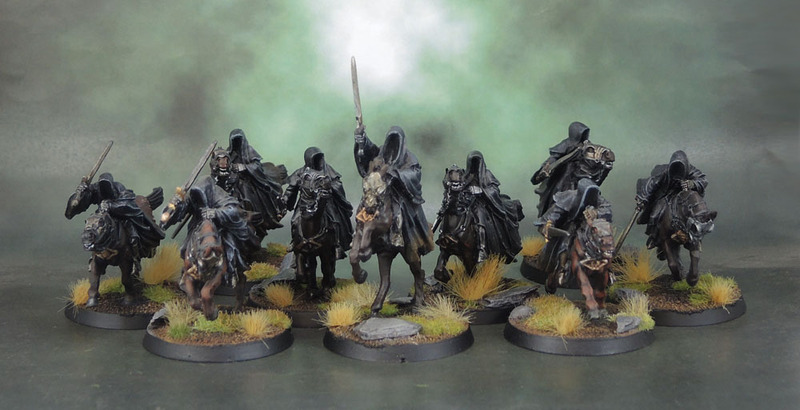 The Fellowship of the Ring Scenario Project Pt4: The Black Riders – Mounted Nazgûl completed (June-It ’18) | Azazel's Bitz Box. In a case almost exactly like the previous post, this one is a rehash of another super-recent post about Nazgûl. A few days ago I finished seven of The Nine, and then managed to find two more mounted models. In the last couple of days, I’ve raced against time to complete the final pair, so I’m showing them here alongside their dark brethren as a completed set of Nine mounted Nazgûl, which have use in a variety of games, but I’ve been working on specifically for The Fellowship of the Ring Scenario Project. With only 3+1 sculpts for “standard” mounted Nazgûl from GW, these last two were always going to be duplicate sculpts. Unfortunately, they’re both the same sculpt – so now I have four of the same base rider in a set of Nine, which is a little unfortunate. I mean, it is my favourite of the non-Witch King sculpts, but I’d still much rather have had 3-3-2-1 than 4-2-2-1. Even with some arm variation, it’s become quite repetitive. Finally, here they all are – multibased for Kings of War. 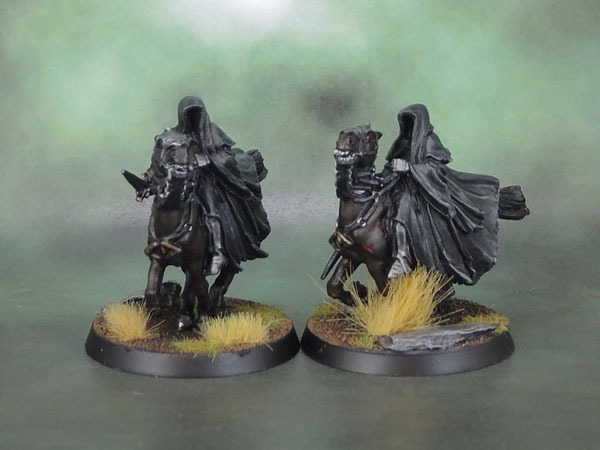 In their present form of “basic” Nazgûl, I’ll likely use the Vampiric Cavalry rules for them. When I next get around to playing. Ha! Well done, they look awesome together. And well done completing your challenge, I missed my deadline by one day! Completed my unit today after a mega effort last night. I better start planning July’s effort! That’s close enough mate – just post them up for June-It anyway. I’m anything but punitive here! They look great Az! With them having the same colors, and all being Wraiths, I don’t think I would worry too much about similar sculpts. It adds to the homogeneity, and not in a bad way. Thanks mate – you’re right but I still would have preferred some more unique sculpts. That’s something that was a problem across the entire metal LotR range, let alone the later days of GW’s metal ranges. Dude – so cool! Kudos! 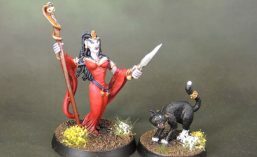 As someone who paints stuff from the Dark Ages when there was only one pose, take heart – these will work! I do like the cloak highlights and now the riders just top it off. Congrats on a great JUNIT! Would you believe that after reading your comment here I just noticed that I completely forgot to add in the weathering powder on the two latecomers? Argh FFS. Well, about to do it now. Excellent work dude – well done!